Graves Motorsports Kawasaki ZX-14R Cat Back Slip-on Exhaust System for the 2012-2019 models. Constructed with stainless steel tubing and featuring dual carbon fiber canisters. Graves Exhaust systems are designed for the elite rider seeking top of the line performance, fit, finish and value. This ZX14 exhaust system was developed using the same technology that has powered the Monster Energy Graves teams to 6 consecutive AMA / Moto America Superbike championships. This kit features a dual canister slip-on exhaust system for your ZX14R. Specifically built with the riders’ needs in mind this performance package always you to purchase sound inserts seperately for customers wanting to limit the sound output from the canisters. New Diamond Shaped Can Designs (Carbon Fiber Cans with Carbon End Caps). Cans mount via light weight carbon fiber can straps. Stock Cans Weight = 32.2lbs. Graves Cat Eliminator System Weight = 8.6lbs (see break down below). For Installation Instructions Please Click HERE. Join Our Mailing ListBE THE FIRST TO KNOW WHAT'S NEW! Use our online Parts and Accessories listings to search for products by Category or by your' specific Make, Model and Year. 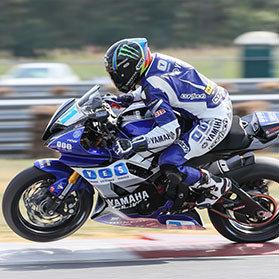 See how our development has powered Graves teams, sponsored teams and riders to 8 Moto America / AMA Superbike championships along with numerous 600cc titles. We at Greaves Racing have been made believers in the Graves Product Line for the Yamaha YXZ 1000r, the only UTV we use and trust under our awning! Our experience with the exhaust and the ECU Tune for this unit have proven to be of the highest quality and is recommended for anyone wanting great results! The parts, accessories, and technology that Graves develops in conjunction with our race team partners for the Graves race teams are refined to perfection through tireless work at our Van Nuys, CA facility, the MotoAmerica events, and many tests at race tracks across the country. This hard work has resulted in many race wins, numerous championships, and elevating the level of our partner race teams. These same parts, accessories, and technology are available to our customers. Rick Williams - Chuck Graves Racing, Inc. I purchased my 2016 Yamaha R1M in May, added the Graves cat elim, flash tune and autoblip right away. My bike is an animal now totally changed. Thank you. I purchased a cheap flimsy tag bracket for my ZX10 that almost vibrated my tail section off. Tossed in for the Graves' setup and never looked back these things are built to last!